#Update (26-06-2018): BSEB going to upload the matric result today on its official website. Students can check their results through below given links. Bihar Board BSEB Matric Result 2018 Name Wise: Bihar School Education board (BSEB) going to upload Matric Result on 26 June 2018 so students who appeared in Matric / 10th class examination can check their results through bsebssresult.com. The official website of Bihar Board will not host result this year but bsebssresult.com will handle the 10th / matric result this year. Last Year www.Indiaresults.com declared the result but this year BSEB decided to upload its matric result to bsebssresult.com. In this year more than 17 Lakh students appeared in Bihar board matric / 10th class examination. There were a total 1426 centers made to take BSEB matric examination. 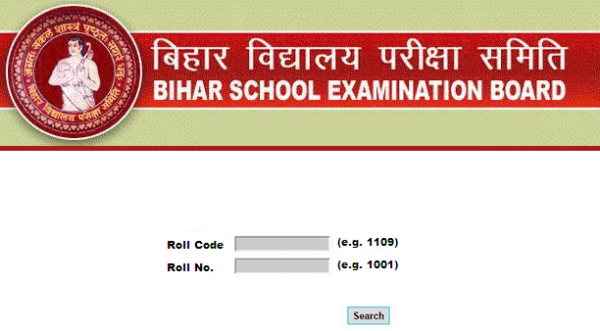 You can check your Bihar Board BSEB matric result through below given link. Students can check their results through above given link by entering their roll number. we will also try to provide you name wise result so check our website for regular basis. Bihar Board issues a official notification regarding the result declaration date. There are a lot of website were claiming about the expected result declaration date but BSEB cleared all doubts this year and they will declare the matric results on 26th june. After the result declaration you can able to check your results by entering your roll number but if you forget your roll number then we have a solution for your problem. we will try to upload name wise result of Bihar Board BSEB matric / 10th class tou our website. Indiaresults.com uploaded the Bihar Board matric / 10th class result last year so we able to provide you name wise result we will post an update here. Candidates should check our website on 26th june after result declaration on main website. Bihar Board also declared their BSEB Inter result 2018 in first week of june so now Bihar board have to declare the 10th class results. If candidates have facing any issue to check their results through web or they want to check their Bihar Board BSEB matric result through SMS they have to follow given steps to check their results through SMS. If you want to get your result on SMS you have to follow the given pattern or method to get it. After sending the text message candidates will receive their results within 2 minutes. A text containing their results will be received in your inbox. Bihar Board First decided to upload the matric Result on 20 June but in Gopalganj College someone theft the answer sheets so a conflict created so bihar board decided to postpone the result by 26 june 2018. Gopalganj police also trying to caught the culprit because a total 42 thousand copies were theft from the college. Bihar Board also verifying the topper students because last year a huge issue created because of Bihar board topper so bihar board is not responding in this matter. Bihar Board rechecked the answer sheets of topper students and they also created the toppers list. Board also called the students for the verification so that no nuisance occur this year but All the preparations were stuck because of this theft. A News on Bihar Board Matric / 10th class result postpone issue. Education Minister Krishna Nandan Prasad Verma will announce bseb matric result 2018 on 26 June at 11 AM. general secretary RK mahajan will be also there during the result declaration. After that candidates can able to check their results through biharboard.ac.in thats the official website of Bihar Secondary Education Board. Bihar Board is now busy in result preparation and this year they don't that some will point any finger on board because of last year fraud. Every Year Bihar Board BSEB Declare the 10th class result around 10 June but this year due to some precaution the result has been delayed. Candidates should stay in touch with us to get all latest updates about the BSEB results.